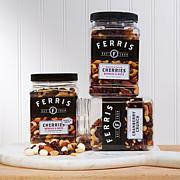 967-154 Ferris Coffee & Nut Co. Snack on something satisfyingly delicious. 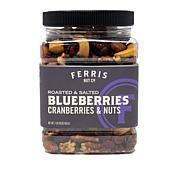 This combo features dried berries and raw, unsalted hearty nuts for a delectably guilt-free goodie. 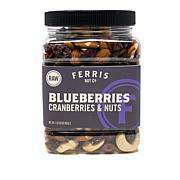 Keep a jar in your desk at work for the perfect midday nibble. 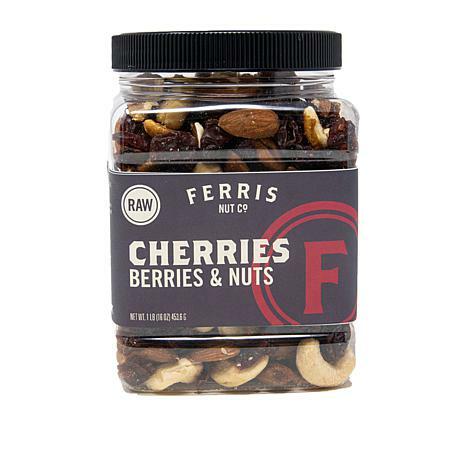 Contains nuts. Manufactured on equipment that processes products that contain peanuts, tree nuts, soy, wheat, eggs and milk. This product may contain or come into contact with milk, nuts and peanuts and should be avoided by persons with allergies to these foods. 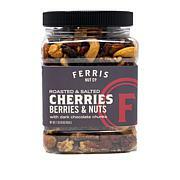 Ingredients: Cranberries, Cherries, Almonds, Pecans, Cashews, Sugar, Sunflower Oil. This came un handy when my fam needed a quick healthy snack on the road!! Perfect to keep in a work vehicle or at your desk for a quick go to energy source!! 1 of the best mixes! I always try to get Raw, Unsalted whenever it's available! Looking forward to MORE mixes in the future! These are addictive! Very good! Delicious,Delicious so fresh and tasty. Cant stop eating. I buy this yearly as a Christmas present for friends. It is nearly impossible to find anything that is unsalted. So happy I am able to get this great product from HSN.